Predicting profession, a person is likely to take up and succeed, is quite a complex job and it is one of the most sought after fields in predictive Vedic Astrology. Numerous areas and highly competitive environment; be it business, service, profession, politics, etc., and its magnitude are the areas which have charged the atmosphere making it quite difficult for the decision makers to identify one which would be most suitable from the point of view of success and also the potentialities of the seekers. There are number of factors which help us in arriving at a decision on this vital issue, viz. the nature of sign falling in the ascendant, tenth house governing profession, second house ruling the status, the impact of the third house which rules enterprising nature, the eleventh house signifying income and the ascendant of dasamsa (the divisional chart for analysis of professional matters) of a native. All of the foregoing factors collectively govern the magnitude of the professional matters. The sign of a royal planet like the Sun, the Moon or affluent planets Venus, Jupiter, Mars, etc. indicate the level of affluence of the profession of a native and the income, there from. The lords of the second, third and ninth houses, if containing mooltrikona signs, also act as the Sun. The strength of the lords of these signs and the operating planetary periods hold the key to decipher the planetary influences. Similarly, understanding the nature of planets becoming significators for profession and the planets exerting close influence on the houses ruling professional matters is necessary. The lords of the tenth and the second houses, if containing mooltrikona signs, are considered as the primary determinants for analysing the professional affairs. In case there is no mooltrikona sign in any of these houses, then the lord of the first house is considered the prime determinant. The planets closely influencing the tenth and the second houses or the ascendant, if there is no mooltrikona in the tenth and the second houses, or closely influencing their lords by way of close aspects/conjunctions as well as the planets placed in these houses act as secondary determinants for analysing the professional affairs. The lord of the ascendant of dasamsa containing a mooltrikona sign becomes an additional primary determinant for profession. The close influence of the lord of the third house on the houses ruling professional matters or the third house, itself, indicates business ventures. The significations of planets fructify during their own main/sub-period as per their strength. The readers may please note the stress being laid on the strength of the planets. The weakness of the planets in a nativity is the very reason of existence of this divine science. It is but natural that a native may approach an astrologer in the hour of difficulty and thereafter he may like to utilize the services of this divine science without being faced with the problems but to avoid the incidence of problems as also to augment his ventures for optimum benefits. The real job is to find out the true strength of those planets which are apparently strong in the rasi chart of a nativity. As per Maharishi Parashara the weak planets of the natal chart do not acquire any strength in any of the Vargas. The weak natal planets fail to bestow good results even if they are in strength in the divisional charts or having maximum benefic bindus in Ashtakvarga. In fact delineating anything from a natal chart requires application of the principles in a comprehensive manner. Most of the times, the significators may be overlapping and indicating more than one area of pursuit, while a person might have one of the area as a hobby. Similarly, a planet signifies variety of occupations. For example (1) the Sun signifies administration, practice of medicine, politics, etc. (2) Venus signifies practice of life saving drugs, the business of artistic nature, engineering or luxury items, financial advisor's role, etc. (3) Mercury signifies dealing in writing, accountancy, analytical studies, application of law, designing work of engineering involving calculations, etc. (4) The Moon signifies love and care, house keeping, public relations, etc. (5) Mars signifies execution, commandership in the armed forces, initiative and entrepreneurship, etc. (6) Jupiter signifies practice of law, teaching, financial management, advisory roles, propagation of spirituality, Astrology, etc. (7) Saturn signifies participation in mass production involving large work force, low technology industry, leadership of labor/industrial workers, service, etc. What we have to see is which type of influence is more in operation and has to synchronize the same with the operating planetary periods. As a group, those planets which exert more influence indicate the choice or area of profession. The prominence, fame, wealth or notable contributions in various fields is the result of a group of strong planets congruent in nature. The group of Venus, Jupiter and Mercury may indicate the area of profession as advisory role in financial institutions or in financial matters, legal advice, or collectively legal and financial areas. The confluence of the Sun, the Moon, Mars, Jupiter, etc. as a group may indicate good positions in administration. The confluence of Venus, Saturn, Mercury and Mars may indicate a profession of engineering. The confluence of Mercury, Mars, Venus and the Sun may indicate a profession in the technology sectors. Further classification in the major field depends on the leading role of one of the significators. When the significators are weak or the main period of weak planets is in operation, the natives go in for routine jobs i.e. clerical or mechanics, sales representatives/assistants, etc. or merely work as helping hands. For entering into business the role of the third house and the Sun, Venus and Mercury is supreme as they provide planning, trading and organizing capabilities. Royal planets (the Sun and the Moon) and Mars, the planet of executive authority, under the benefic influence of Jupiter becoming significators of profession indicate involvement of political career. Rahu gives impetus to the efforts. However, success depends on the good placement of Rahu and neither it should be aspected by or related to the functional malefic planets nor it should be closely afflicting other planets in the natal chart. Ketu in its main/sub-periods often retards the growth. Persons with weak Mercury, which rules planning and analytical faculties, often end up with losses in business because of mainly two reasons i.e. (1) they depend on the wisdom of others; and (2) they take wrong decisions when they are under great mental pressures. For detailed study of this aspect, the readers may refer to Chapter 15 of our book, �Predictive Techniques and the Application of Astrological Remedial Measures� and study our book, "How to Avert Professional Setbacks." By way of a few charts, we will further see the confluence of various groups of planets. The ascendant lord, Mars, being prime determinant of professional matters is placed in the house of status but is weak. Mars gives entrepreneurial competence. Another planet which makes a man an industrious person, Saturn, though weak, is placed close to the most effective point of the ascendant. The Moon is strong in the chart and closely influences the most effective point of the tenth house. Both Jupiter and Venus are strong but they are not close to the most effective point of the houses. The Sun is afflicted by Rahu-Ketu axis. The ascendant of the dasamsa is Sagittarius and the planets Mercury and the Moon are in their signs of debilitation. The advantage of the strength of the Moon in the rasi chart is lost due to debilitation in dasamsa so far as the professional matters are concerned. The education of the native was completed in the main period of Venus. As the planets Mars, Saturn and the Moon become significators for the professional pursuits, the native, due to the weakness of the planets involved, went in for a diploma course in engineering. The nodal affliction to the Sun either keeps the person away from governmental jobs or lands the person in trouble in the government job and the person is compelled to leave the job. The weak planets did not allow the native to use his entrepreneurial skills and he joined his brother's industry. The strong Jupiter and Venus, however, helped him in getting good gains due to the prosperity of his brother's industry. The lord of the tenth house, Saturn, being prime determinant of professional matters is placed in the house of status. The lord of the fifth house, debilitated Mercury, is closely aspected by the functional malefic planets, Jupiter and Ketu, and the functional benefic Saturn. The influence of Jupiter on the lord of the fifth house bestowed the native with management studies. The aspect of Saturn to Mercury reduces the impact of weakness and afflictions to some extent. The Sun, is in the twelfth house and in its sign of debilitation both in navamsa and dasamsa. The functional malefic planets are not close to the most effective point of the houses of their location. The sign Cancer rises in dasamsa and the Moon becomes the additional prime determinant of the professional matters. The native after doing his engineering graduation joined a government organization. Due to weakness of the prime and additional prime determinants of professional matters and debilitation of the Sun in dasamsa, the status of the native was not matching to the position held by him. Mars becoming one of the prime determinants of professional matters is placed in the third house ruling initiatives and courage. The Sun, ruling the house of status, and being another prime determinant of professional matters is placed close to the most effective point of the twelfth house. The impact of Jupiter, the lord of the sixth house, is close to the most effective points of the house occupied and the houses aspected and the Moon. The exact influence of Jupiter on the most effective points of the ascendant and the fifth house bestowed the native with medical studies as Jupiter rules the sixth house. The exact impact of Jupiter as a functional malefic planet gave health problems to the native, conflicts, an uncompromising wife and sufferings to the father. The weak Venus is lord of the fourth house and Ketu is closely conjunct with the most effective point of the fourth house. The significator for intelligence is exalted. The Moon becomes the additional prime determinant of professional matters as its mooltrikona sign rises in the ascendant of dasamsa. 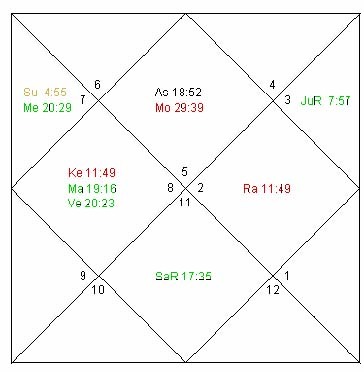 Taken together the chart indicates a profession connected with the significations of Mars, Sun, Moon, Rahu and Jupiter. The position of the lord of the second house in the twelfth house in addition to the significators, weigh the scale in favor of a profession connected with the hospitals. The native is a medical graduate. The weaknesses and afflictions, however, does not indicate a successful and flourishing career. Mercury becomes the prime determinant of the professional matters. The close influences in the chart are of strong Saturn on the ascendant and the fourth house, Mars and Venus on the fourth and tenth house and of the Mercury on the third house. Aquarius ruled by Saturn rises in the ascendant of dasamsa and Saturn becomes the additional prime determinant of the professional matters. The influence of Mercury gives an analytical bent of mind and Mars, Saturn and Venus all give interest in engineering studies. The native is a graduate engineer and during the period of his engineering studies was running the main period of the yogakaraka Mars, which is exalted in the dasamsa chart. The native is enjoying a prosperous career with an international trading organization as he is having five strong planets. In this case Mercury, Venus and Mars act as Sun and all these planets are strong in the chart. The Sun and Jupiter are the prime determinants of professional matters in this case. The Sun is placed in the eleventh house, close to the most effective point of the house indicating good income from the profession ruled by the Sun even though the Sun is weak. Mars closely influences the most effective point of the tenth house. Rahu is closely conjunct with the most effective point of the house of status and aspects the tenth house and Mars closely. Jupiter, the lord of the house of status, is in the ascendant. Virgo rises in the dasamsa ascendant. Mercury becomes the additional prime determinant of the professional matters. The Moon acts like a Sun, it is strong and closely influences the most effective points of the third and ninth houses. The group of planets the Sun, Mars, Rahu, Mercury and the Moon give a predominant interest in the profession of medicine. Jupiter's distant connection combined teaching. The native went in for teaching in medicine. The influence of Mars and Rahu as functional malefic planets is bad in other matters but their placement close to the most effective point of the houses create interest in matters pertaining to them. At the time of education the native was in the main period of Mars. The placement of the lord of the twelfth house in twelfth house bestowed with good living in foreign lands. Saturn is the prime determinant of professional matters in this case. The sign Cancer rises in the dasamsa ascendant and therefore, the Moon becomes the additional prime determinant of professional matters. Mars closely influences the most effective point of the tenth house in the rasi chart and it becomes the secondary significator for professional matters. The Moon acting as a Sun is strong and placed in the chart in the house of fortune. Accordingly, the significators for profession turn out to be the Moon, Mars and Saturn in this nativity. The native is a doctor of medicine. The affliction of Mars to the most effective point of the fourth house caused marital dissonance and problems in his professional pursuits. Saturn becomes the prime determinant for the professional matters as there is no mooltrikona sign either in the tenth or the second house. In dasamsa Leo rises whose lord is exalted in the rasi chart and becomes the additional prime determinant for professional matters. Saturn and Venus closely aspect each other and both of these planets being functional benefic planets closely influence the most effective point of the ascendant. Venus acts as the Sun in this case being lord of the ninth house. Mars, Saturn and Jupiter influence the ascendant of dasamsa. The confluence of Venus, Saturn, the Sun, Mars and Jupiter in the nativity took the native to organization and financial management. The native is an MBA and CA and is doing well in his profession of financial consultancy.